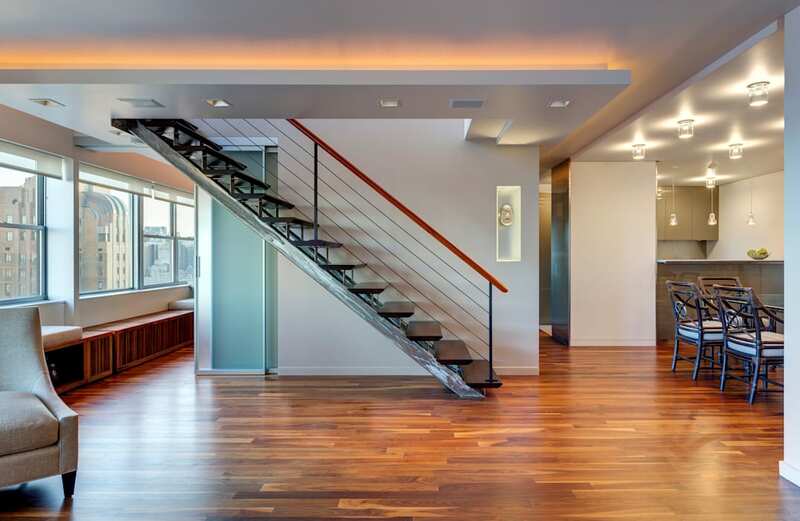 This 1,800sf (550sm) upper west side duplex, on the 36th/37th floors, was designed for a retired couple. A set of ancient Japanese design aesthetics, embraced by the Owners during the years the family lived/worked in Japan informed the design. These include ideals of wabi (transient stark beauty), sabi (aging), and yūgen (profound subtlety). The space divides into public/private. The lower level is an open utilitarian space for dining/ entertainment with floor-width views and sliding Shoji screens. The private bedroom “quarters” are on the upper level. Dropped-ceiling-planes with lit edges create the illusion of a taller spatial-openness. Minimal tolerances rely on precision in execution completing Enso “circle”– the absolute in strength/elegance/void.